The natives of Central Asia. Photo by / Flickr. Central Asia is, for most Americans, a murky and mysterious region on the world map. But the five relatively new states along the old Silk Road deserve further investigation. Start with this primer to the 'Stans to get your bearings. Central Asia is much more than Borat, yurts, and horses. Since emerging from the shadows of the Soviet Republic in 1991, the five independent Central Asian states — Kazakhstan, Kyrgyzstan, Uzbekistan, Turkmenistan, and Tajikistan — have undergone a quarter century of cultural, political, and economic change. Central Asia has stunning natural wonders, sleek metropolises, well-preserved historical sites, Silk Road bazaars, and more. Each Stan is unique in its own way, yet the region shares a history of Turkic roots as well as a Soviet legacy, which connect them linguistically and culturally in both modern and historical ways. Tradition is strong in these parts, and the nomadic lifestyle of centuries past is still prevalent. Hospitality, respect for elders, and emphasis on the family are key. For travelers willing to navigate the bureaucracy that can sometimes be cumbersome during planning, a great adventure awaits. Where else in the world can you snack on horse meat and fermented camel milk while taking in expansive Asian skies? The colorful Presidential Palace surrounded by government buildings in downtown Astana. Photo by / Flickr. The largest landlocked country in the world, Kazakhstan's varied landscape is the perfect backdrop for a multitude of activities, many offered through a solid tourism industry. Visitors from many countries, including the United States, can enjoy visa-free travel for up to 30 days and will find this country one of the more developed in the region, greeting its visitors warmly in true Central Asian fashion. 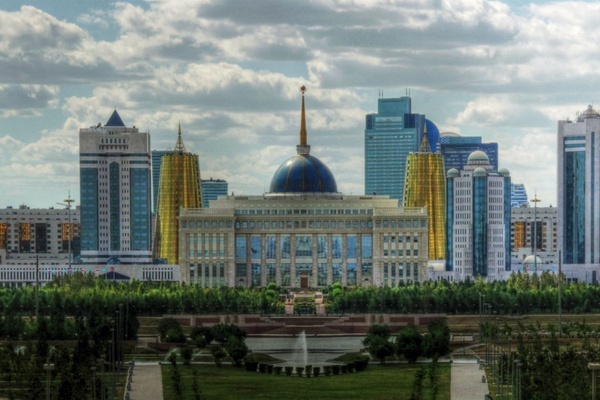 Kazakhstan is home to two large cities: the newly constructed and somewhat dystopian capital of Astana (named for the Kasakh word for "capital") in the north, and Almaty, the historic former capital city and arguably the most cosmopolitain city in the whole of Central Asia, in the south. Kazakhstan is a rapidly developing country, working towards the goal of becoming one of the top 30 world economies by 2050 through the implementation of various programs put forth by President Nursultan Nazarbayev. 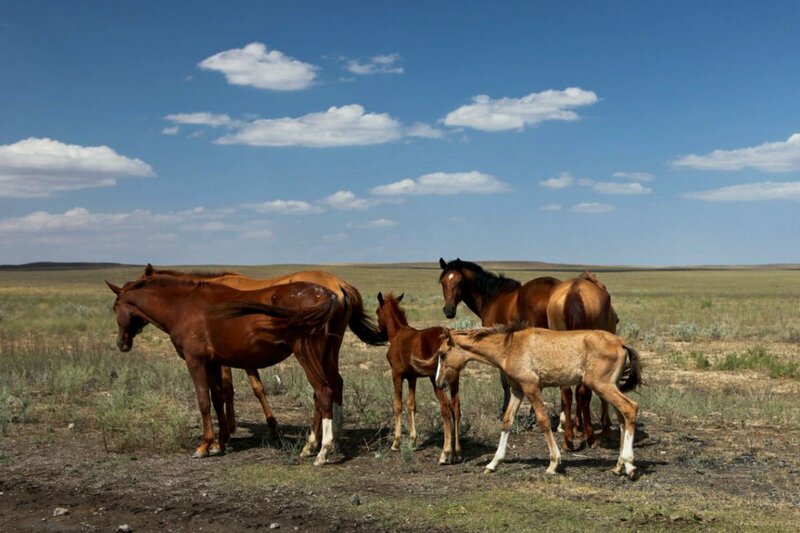 You can find it all in Kazakhstan: , modern metropolises dotted with global chains and shopping malls, mountains, religious pilgrimage sites, sprawling steppes, and more. 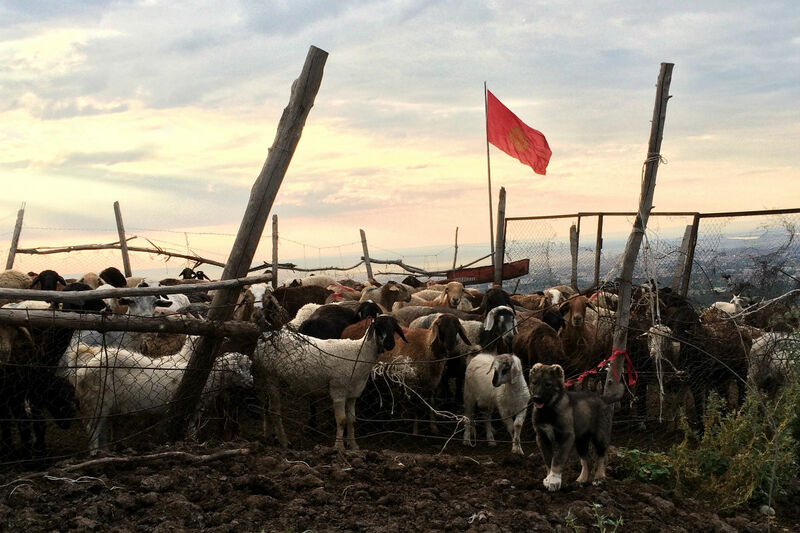 A local family's livestock on the outskirts of Bishkek. Photo by Tess Chapin. 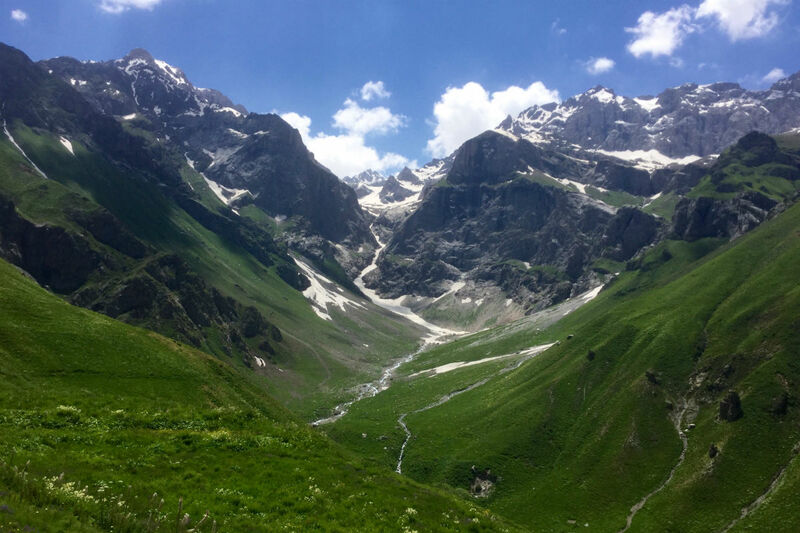 Kyrgyzstan is a small, mountainous country that offers an incredible variety of outdoor activities through a locally cultivated and well-maintained tourism sector, earning the title of the trekking and hiking capital of Central Asia. Well established networks in Kyrgyzstan offer visitors a unique opportunity to mix with the locals. Community tourism offices connect foreigh travelers with individuals offering a plethora of services: accommodations, guides, coordination of activities like camping, trekking, and horseback riding. The only democratic country in the region, the capital city of Bishkek is youthful, with a vibrant nightlife, a comparatively greater degree of social awareness and progressiveness than its neighbors, and new businesses drawing from international influences. At the sprawling Osh Bazaar in Bishkek, the proximity to China and the Silk Road legacy is felt strongly. Beautiful is the world's second-largest alpine lake. Kyrgyzstan is a poor country, but they welcome visitors with a visa-free policy. One of the cheapest countries in the region, travelers can indulge for mere dollars. The lush Ziddi Valley north of the capital city of Dushanbe. Photo by / Flickr. Tajikistan is unique amongst the five Stans, a cultural outlier due to its Persian roots and a tough history of conflict and economic issues, traceable in part due to its proximity to Afghanistan's opiate drug trade. It is the poorest of the Central Asian countries, though internal relations have stabilized since its civil war in the 1990s. The country is currently in the process of increasing its tourism sector, aiming to attract one million foreign visitors a year by 2020. For now, it's off the beaten path — even for those already on the off-beaten-path that is Central Asia! Intrepid of travelers will be greeted by the pristine , unspoiled and staggering in their beauty, dotted with lush mountain valleys in between, without any of the riff-raff of an established tourism sector. The Tajik people speak a language derived from Persian, diverging from the Turkic language group that links the other four Central Asian countries. The Soviet legacy of this country means that many Tajiks speak Russian as a second language. 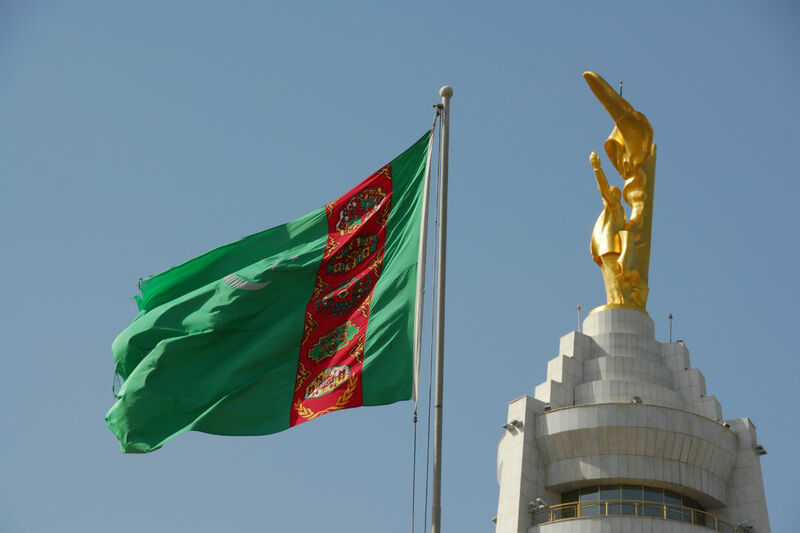 The Turkmen flag and golden statue of deceased President Saparmurat Niyazov in downtown Ashgabat. Photo by / Flickr. Turkmenistan is sometimes referred to as the North Korea of Central Asia for its isolationist tendencies and the bizarre personality cult that has been created around its leader. It can be very difficult to gain access to this hermit state, as the government keeps a tight lid on who comes and goes. If intrigue is your thing, Turkmenistan will serve you well. There are a few Silk Road-era attractions, including the ancient city of Merv, accessible from the modern day city of Mary, which lies on an oasis in the Karakum Desert. There are other sites on the Caspian Sea, though they are paltry in their offerings. Turkmenistan is home to the Door to Hell, a deposit of natural gasses that have been burning in a crater the size of an American football field in the middle of the desert since the 1970s, when a gas rig collapsed into the crater. How's that for a tourist attraction? Looking forward, Turkmenistan will be hosting the , a pan-continental sports competition held every four years. 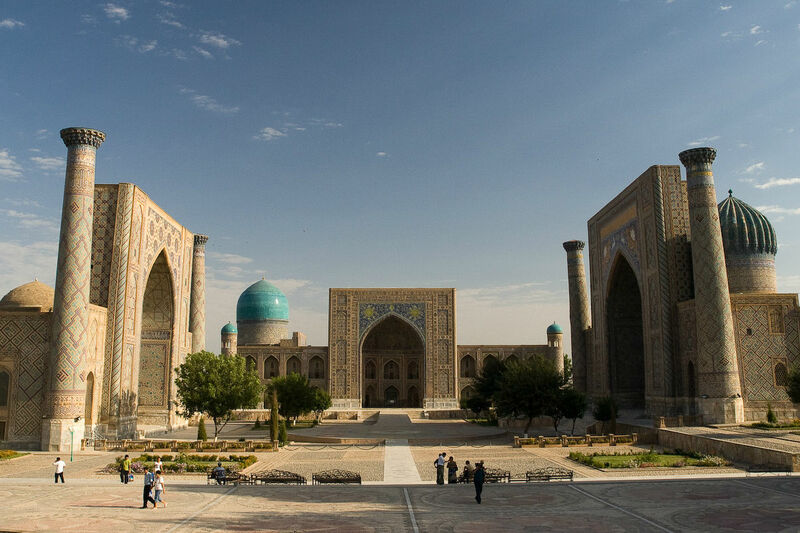 The mosques and mausoleums of historic Samrkand, Uzbekistan. Photo by / Flickr. Uzbekistan is the premier location for those interested in , as it is home to three stunningly well-preserved Silk Road cities which form the core of the Uzbek tourism industry: Samarkand, Bukhara, and Khiva. Uzbekistan is the region's most populous country, with a population of more than 30 million people. The capital city Tashkent is the largest city in the region (three million and counting). While there is a lot to see in this country, it is one of the more governmentally complex, and getting the proper travel documents can be tricky. Visa support from travel professionals is invaluable: It's best to tour the country with a group or participate in a pre-planned trip. The recent passing of President Islam Karimov, who had been in power since 1991 and led a repressive regime that attracted international attention for its rampant human rights abuses, corruption, and overall shady nature, will undoubtedly bring a period of government instability. But the historical tourism core operates somewhat outside this realm, as the government relies on revenue brought in by this industry. Tess is an intern at Popupla and a Central Asia nerd. She travels for the discovery.